26 people, many of whom belong to the tight-knit community of Sutherland Springs, Texas, were killed Sunday after Devin Kelley walked into the First Baptist Church with an assault rifle. 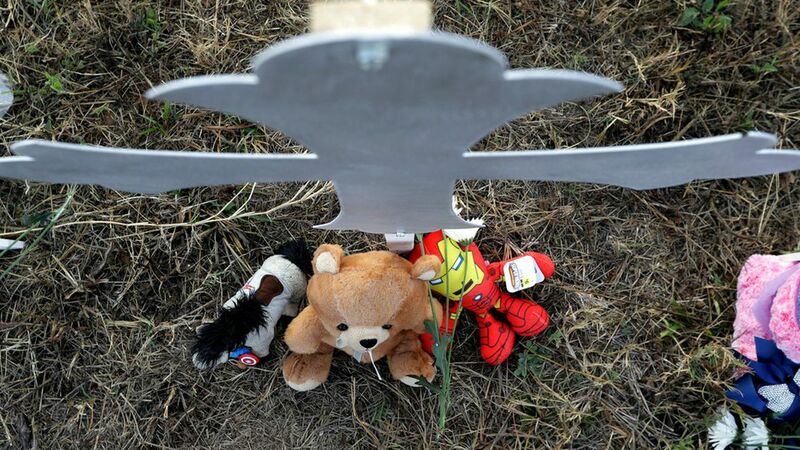 About half of the victims killed were children, including one who was only a year old. One family alone lost 8 people, including a pregnant woman and her unborn child. Of the 26 killed, 23 were found dead inside the church, while two people were found outside, per TIME. One person died at a local hospital. Below are the names and descriptions of those who have been confirmed dead, with links to more information. Lula Woicinski White 71, the grandmother of Kelley's wife. She was a frequent volunteer at the church. Relatives described White as a "caring person ... God-loving person." Annabelle Pomeroy 14, was the daughter of Frank Pomeroy, the church's regular pastor who was out of town during the shooting. Frank described his daughter as "one very beautiful, special child." Haley Krueger 16, loved children and wanted to become a nurse, her mother said. Richard, 64, and Theresa Rodriguez, 66 had been married for 11 years and were longtime members of the church. They were fans of gardening and maintaining their yard. Robert, 51, and Shani Corrigan, 51, were high school sweethearts who married in 1985. Originally from Michigan, the couple moved to Texas and became active in the church. Robert served in the Air Force for 29 years. Joann Ward, 30, and her daughters Brooke Ward, 5, and Emily Garcia, 7. Joann's brother Michael said he carried his sister's wounded 5-year-old nephew Ryland from the church once the firing stopped. The boy is in critical condition. Karen, 57, and Robert Scott Marshall, 56, were a religious couple who met while in the military. "They had a love that lasted over time," Robert Scott's sister, Holly Hannum, told People. Dennis, 77, and Sara Johnson, 68. Their family confirmed their deaths to the Washington Post but declined to comment further. Keith Braden, 62, a grandfather, former Army veteran, and regular of the church. He had recently gone into remission from cancer. Peggy Lynn Warden, 56, died shielding her grandson from the bullets. She was a volunteer teacher at the church. Bryan Holcombe, 60, the guest pastor on Sunday, and his wife of about 40 years, Karla, 58 were both killed. The two high school sweethearts lived on a farm in nearby Floresville. Bryan was reportedly walking up to the pulpit when the shooting began. Marc Daniel Holcombe, 36, was Bryan and Karla's son and went by "Danny." Noah Holcombe, 1, was Danny's daughter. Danny's colleague said Noah's parents had tried for a long time to have a child. Crystal Holcombe 36, a pregnant mother of five, was Bryan and Karla's daughter-in-law. She home schooled her children and was very involved in the church. Crystal's unborn child was also included in the death count. Megan Hill, 9, Emily Hill, 11, and Greg Hill, 13, Crystal's children, all died. Crystal's unborn child was also counted in the official death toll. Two of Crystal's children survived and are in the hospital with her husband, John Holcombe. Tara Elyse McNulty, 33, a close friend of the Holcombe family, also died. She lived with Bryan and Karla Holcombe and called them Mom and Dad.